Now that the weather is getting colder, I’m officially in soup and chili mode. 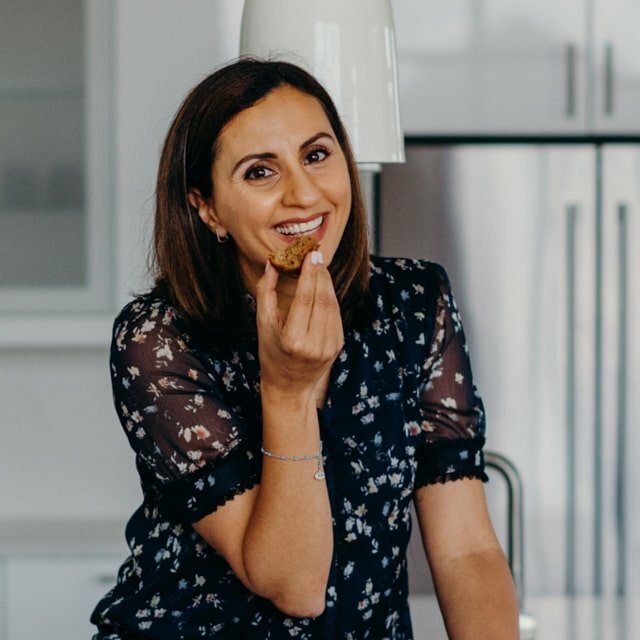 I’m going to be sharing a lot more soup recipes in the next couple months, especially as we all start to think about healthy nutrient-dense protein packed meals. 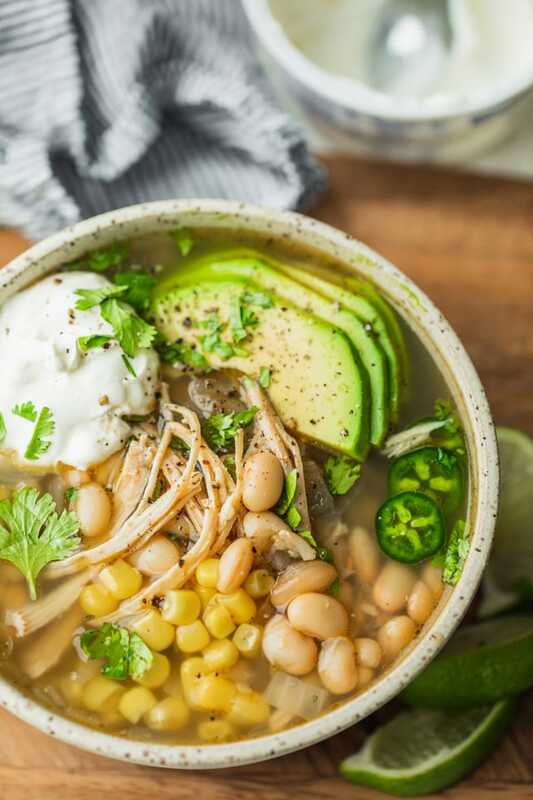 Kicking off soup season with this easy white chicken chili. 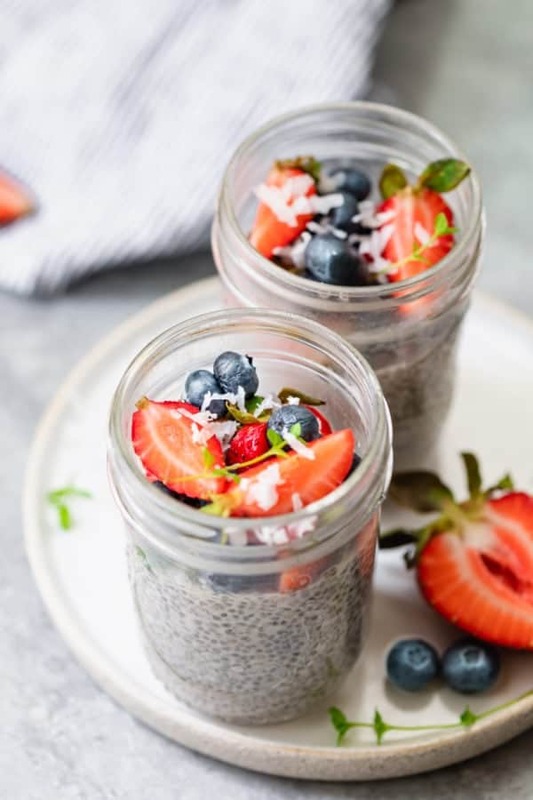 Because a) it’s super easy, b) it’s super healthy and c) it’s super yummy. 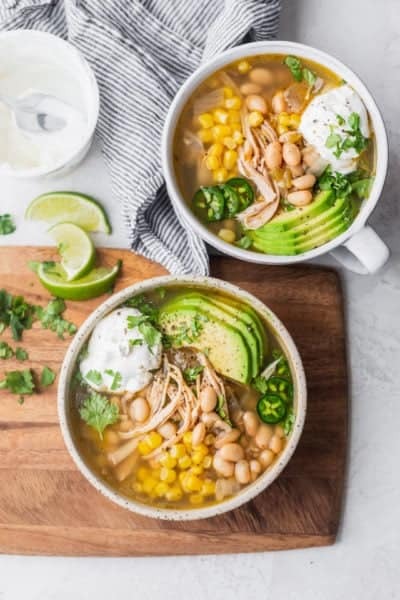 What are the ingredients for white chicken chili? 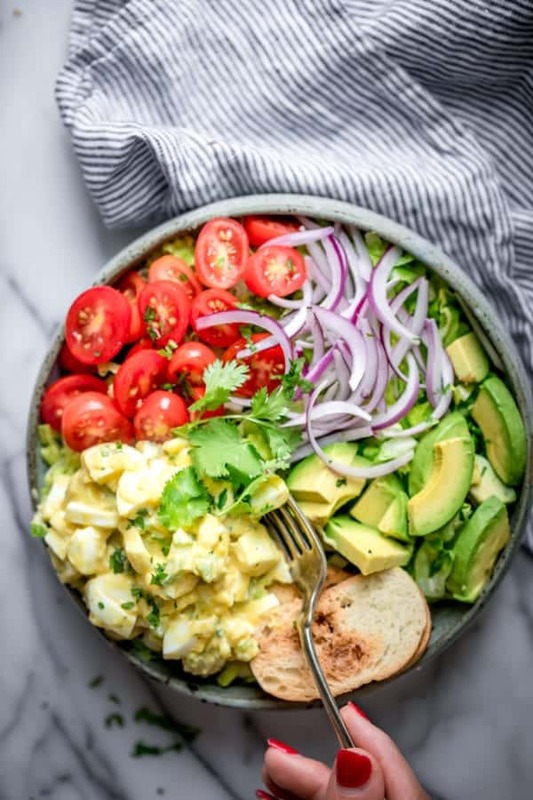 Toppings: sour cream, avocado, jalapenos, cilantro and so much more! 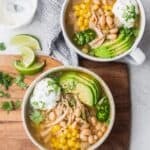 How do you make white chicken chili? To start, you’ll want to heat up the aromatics: olive oil with diced onions and garlic. 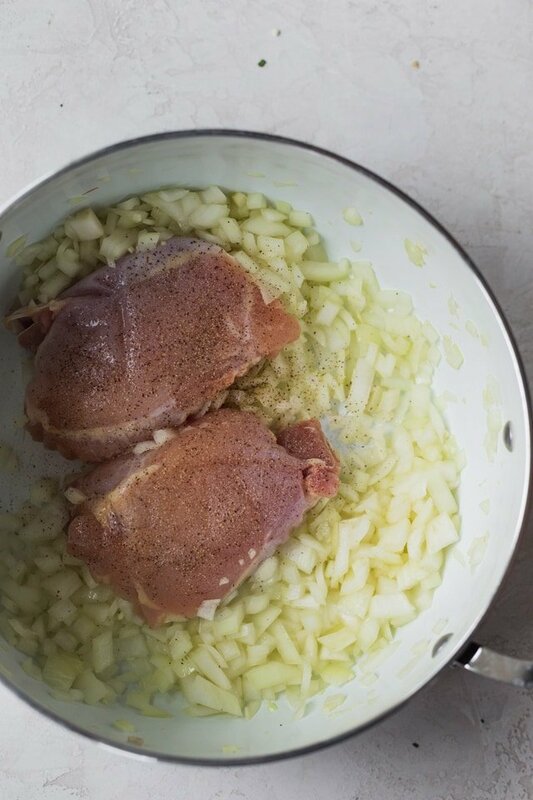 Once those are soft, add the chicken thighs on top, cover with water or chicken broth and cook. In this way we’re flavoring the broth for the soup while cooking the chicken. Once the chicken is cooked, remove it from the broth, shred and set it aside. Next you’ll add just one can of the white beans and use an immersion blender to blend it all together. This creates the creaminess of the soup, without having to add flour, cream cheese or heavy cream. 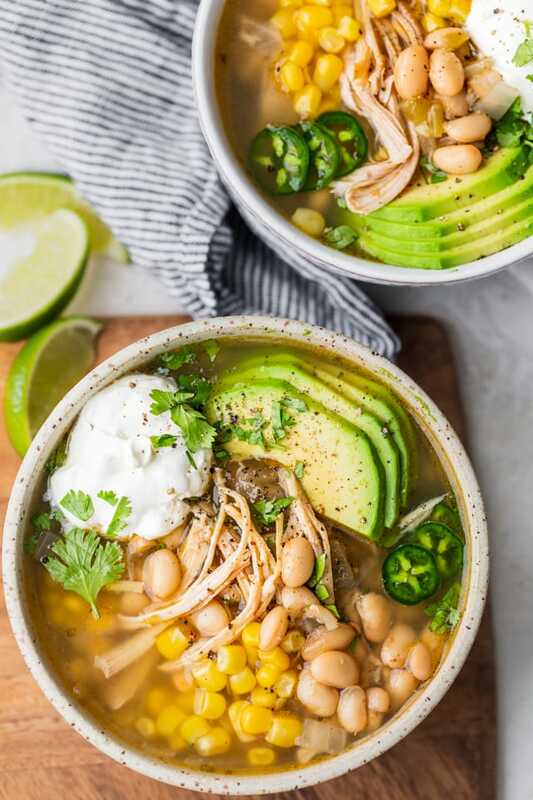 Finally, you’ll just add the rest of the beans, the shredded chicken and the remaining ingredients to the pot, and let all flavors cook together and simmer. Now you’ll notice when the chili is done that the broth is still not super thick and has a more liquid consistency. Keep in mind that this is intentional and that the chili will continue to thicken as it sits. However, if you want to thicken it fast, you can use flour. When adding flour to soup, just use 1-2 tablespoons and whisk it in a small bowl with a cup of broth removed from the soup. Don’t add the flour directly to the soup or it will clump up quickly. Add creaminess without any cream: Create a creamy texture for the soup without any heavy cream or cheese by blending the white beans. White Norther beans or Cannellini beans have a creamy buttery consistency. When you blend them along with the onions and chicken broth with an immersion blender, it creates a thicker broth and adds the creaminess we want. Use rotisserie chicken to make it faster: Ok, so this recipe is super quick and easy to make. But if you want to make it even faster and easier, use leftover rotisserie chicken. That will save you time cooking and shredding the chicken. Allow the chili time to rest: Like all soups and chili, the flavors get better as they sit together for a while and meld. Not to mention, the chicken also has a chance to get more tender and juicy. 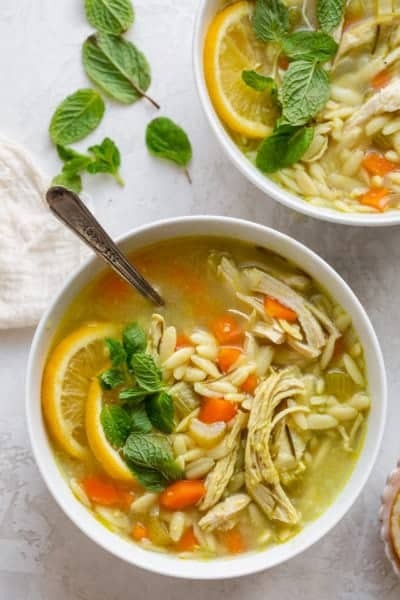 I would recommend making this soup a few hours before you plan to serve it to allow the broth to thicken and the flavor to enhance. This easy white chicken chili recipe is a family favorite, especially in the winter. We love making a big batch of it and basically serve it as a main meal. 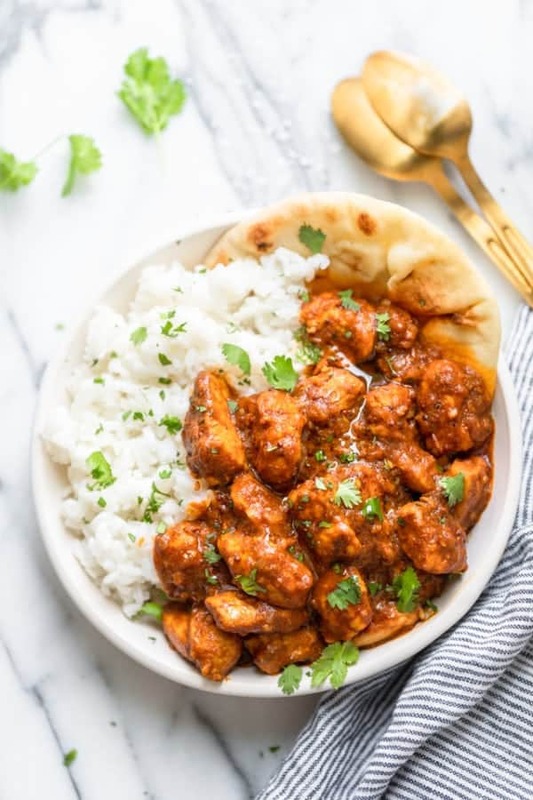 It’s full of protein from the white beans and chicken, full of flavor from the diced green chili and spices, and comes together so quickly! It’s one of my favorite hearty comfort meals. I would highly recommend doubling the recipe even so you can store some for the next day or freezer. We love leftovers in our house…no pots to wash! If you’ve tried this healthy-ish feelgood Easy White Chicken Chili recipe or any other recipe on FeelGoodFoodie, then don’t forget to rate the recipe and leave me a comment below! I would love to hear about your experience making it. And if you snapped some shots of it, share it with me on Instagram so I can repost on my stories! In a large heavy bottomed Dutch oven or stockpot over medium heat, heat the olive oil. Add the onions and garlic, and cook until translucent and soft, about 5 minutes. Add chicken and chicken broth (or water) to the pot and cook over medium heat until tender, about 20 minutes. Remove the chicken from the broth and shred. Add one can of white beans to to the pot. Use an immersion blender to blend the beans with with onions, garlic and chicken broth mixture. This will create the creamy texture for the soup. Return the shredded chicken to the pot. Add the remaining white beans, corn, green chilis, spices, salt and pepper, and stir to combine. Bring mixture to a boil, then cover and reduce heat to low and simmer for 15 minutes. Remove from heat and serve with immediately with toppings of choice. Storage: Store any leftovers in an airtight container. 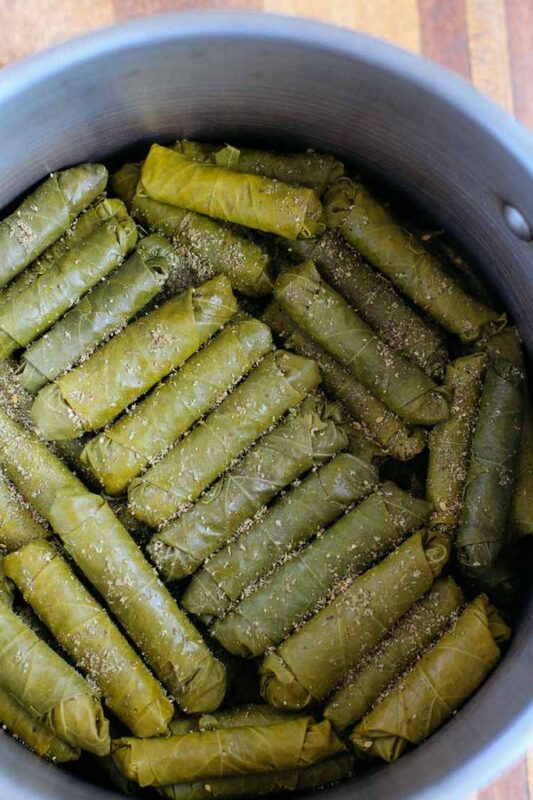 They will last about 2-3 days in the fridge or 3 months in the freezer. Freezing Instructions: You can freeze the soup in mason jars or plastic airtight containers. To defrost, simply remove the chili from the freezer and place in the fridge the night before serving. Then you can reheat all together in a large pot or individually in microwave-safe bowls. Please note the chili may thicken when frozen, so you may need to add some broth when reheating. Substitutes: For best results, follow the recipe as is. However you can change up the spices as you see fit. You can also use cooked rotisserie chicken instead of cooking chicken as part of the recipe. Equipment: I love using my Cuisinart Smart Stick hand blender for blending soups and chili. 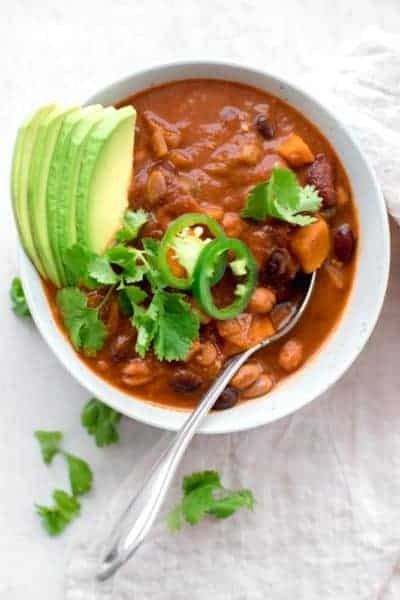 It's quick and easy and gets me the perfect creamy consistency for the chili, without having to add flour or cream cheese. Nutrition: Please note that the nutrition label provided is an estimate only. It will vary based on the specific ingredients used. The nutrition label does not include any of the toppings. Great recipe. Love the toppings.